RosieSandz: My Life Lessons...: Do we inevitably grow up while growing old? Isn’t that an interesting question? Does it boil down to maturity? Maturity… what does that mean? If we were discussing a fine wine it would be one that had rested for ages and was absolutely marvellous to drink. But we’re clearly not referring to any food or beverage, so what does it mean as it relates to people? When and how does one acquire maturity? Do we automatically mature with age? I mean, is there a simple equation to make it all relative? 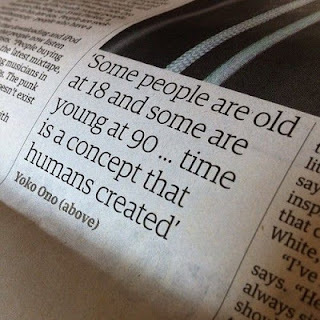 Perhaps: growing old = age, so age = maturity? Early on, we go through life wishing for the years to come faster than the days in them. We can’t wait until we reach that special age; whether it’s the day we turn 18, 21, 30, or whatever. It can certainly vary culture to culture and person to person. We are simply hoping that the accumulation of years will give us freedom, free will, wisdom, and autonomy - which in many of our minds, can translate to being mature, or ready. What many don’t realize is that being of age, doesn’t mean that you are of stage. You can be a 67 year old, grey-haired man with the intellectual prowess of a 12 year old. Likewise, you can be a 12 year old, fresh out of junior high school, and posses the smarts and will-power to impact a generation. The stage you are in, as it relates to your life, doesn’t always coordinate with the age you are in. So to answer my own question; growing older isn’t really a matter of choice. It is not a part of the “options list” we get to choose from in our lives. We can get as many plastic surgeries, Botox injections, and lipo as we can afford, but when Father Time comes knocking, you must answer. As sure as there is a sun and moon, we will all get old… Sorry to be the bearer of bad news. On the other hand, growing up is an option as it is totally different to growing older. Growing up has more to do with your decision to put away childish things. And nobody can convince you to do so; you have to realize that your life requires a more thoughtful, insightful, unselfish, focused and determined you! When you come to this conclusion, you’ll already have crossed into the first stages of maturity. Maturity is a state of mind, and a state of awareness that has nothing to do with age. Maturity is realizing that the world doesn’t revolve around our being. Maturity is acknowledging others, validating their opinions and points of view, while being able to admit when you are wrong and be humble enough when you are right. How we become mature is connected to how we were brought up and how we reacted to our environment and coped with it. Additionally, we can be mature about some things and immature about others. Maturity isn't something that comes all at once and generalizes to everything in our life. Maturity is consistently assuming full responsibility of your choices, actions, and behaviours - while recognizing that it does affect not only your life but also those around you. Growing and reaching emotional maturity is reaching a level of perspicacity that regardless of what life throws at you, you can’t reach while being young. But hear me well, age DOES NOT GUARANTEE MATURITY. Growing old doesn’t equal growing up. I’ve said that a few times throughout this blog, but I really want that to sink in a bit. I can’t possibly stress that enough, as it seems people have it completely backwards. There are loads of immature adults out there, just as much as there are tons of mature young adults. However, the expectation is that with age we grow up and gain maturity (I guess another myth easily proven wrong!). So I guess it all boils down to us. What type of person do we want to be? Do we want to do like the song, and be “Forever Young,” or maybe do like the Toys R Us commercial suggests and, “Never grow up, because we’re Toy’s R Us kids?” Or maybe we want to age like the fine wine I mentioned, and just become better and wiser with time. And we also have to consider that there might be people counting on us to reach our full potential, or maturity. Maybe there are problems out there that we are supposed to solve, but won’t until we fully mature? And until we do, there we will always be anticipation. So let’s get the ball rolling! And it’s perfectly okay to let the process happen, in the same way that I wouldn’t expect to see a 3 year old driving a car. Time cannot dictate when we mature, but rest assured, you will learn some things over time. So let time work to your advantage, rather than against. Let time help you become mature. Be someone that makes you happy. Act the age you want to act…with a background of maturity. Well miss Rose I have to say I agree but disagree at the same time. I think maturity yes does not come necessarily with age, however with age come experiences that help u gain maturity. I think it boils down to learning from these experiences and that in turn matures you. Lords know there are too many adults who no matter how old they get still are very imature! But, I think that is because they didn't learn from their life experiences. That or they just chose to ignore them. So yes your age does not make you mature but with age we are given certain life lesson that mature us. I'm glad you stopped by, always love to read your opinion. This comment left me a bit confuse...what is it exactly you don't agree with?